Giant Trevally, Grand Tourer, Gin Tonic... This is a shirt that does it all.  Easy access spacious pockets.  No seams under arms - No chafing.  Helius Y UV SPF 30+ protection fabric. Premium sun protection by material and design. On the back of the collar is a fold-out flap to give additional sun protection for the neck. Light colours and cool fabric give comfort in hot climates. Button down collar won't flap up to the face even at high speeds on an open boat. 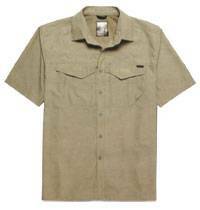  Roll-up sleeves with button down tabs.  Fold out collar for added neck protection. 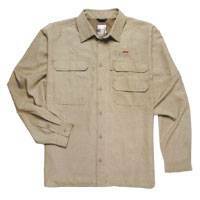  Adjustable ventilation on the back (no chafing, free movement).  Helius Y UV SPF 30+ protective fabric. 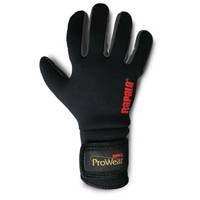  Neoprene gloves for demanding weather cinditions.  Extended cuff for maximum protection.  Grippy dot fabric on palm.  Synthetic leather on sides of fingers. Consistently reach suspended fish at any depth with the CountDown method. The controlled depth technique was introduced to the world with this slow sinking (approximately 30 cm / sec.) lure, and to this day is the standard by which all others are measured. Whether the fish are suspending at certain depths near the weed tops or on bottom structure, the CountDown can get you to them over and over. The lure is weighted for long casts and balanced perfectly for a horizontal sinking position. The CD01 size is specifically designed for smaller and wary fish. The first and still the number one "go-to" lure. Lauri Rapala had no idea the impact his creation would have on the fishing world. Its wounded minnow action is irresistible to fish. Decades after its creation millions of anglers still rely on the Original Floater  one of the most versatile lures ever made. This is the worlds best selling lure. The X-Rap is "all about the action" and it triggers strikes. 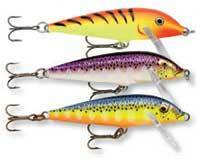 It has the three-dimensional shape of a minnow and is available in three sizes. Prominent scales and the lateral line on the fuselage and the internal holographic foil capture and flash light like a beacon. It's a lure that is designed for aggressive fishing. The angler provides the action and defines the cadence, for maximum effectiveness. The X-Rap has an exaggerated body rolling action on a steady retrieve and it can be fished very slowly if needed. Due to its neutral buoyancy, the X-Rap can be let sit suspended in the water for extended periods to drive even inactive fish nuts. Thanks to its versatility, X-Rap is the only lure you need all season long. The X-Rap Saltwater contains the classic Rapala swimming action yet with the ability to cut hard, dart side-to-side and up-and-down. Xtreme Slashbait Action for larger and saltwater species. With a classic X-Rap finish the Walk 13 is unbeatable for top water action. 4 X. VMC Sure Set Black Nickel feather tail hook taunts them, then stocks' em good with positive hook sets. Designed primarily for salt species, larger freshwater can't resist. 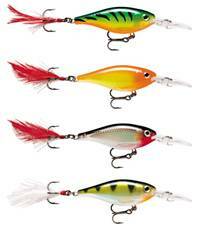 With its unique loud-popping, cupped plastic lip and balsa wood body, the Skitter Pop can be used in a variety of techniques to take fish when they are surface feeding. The SSP12 saltwater model incorporates a rattle that is irresistible to hunting and neutral fish alike.